B-17 at Six O'Clock Low! I learned this weekend that the Collings Foundation is in town this week, flying their B-17, B-24, and TF-51 war birds out of nearby Worcester airport (KORH). 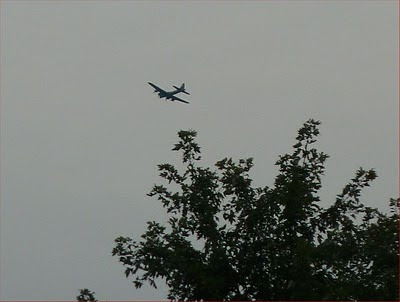 I learned this when a B-17 flew over my back yard Saturday at around 5 pm, then again at about 6 o'clock. That's when it hit me that it had to be sightseeing rides out of Worcester. I checked the schedule and found that there was a 5:30 pm flight today, so I was ready with a camera. Around 5:45 he showed up, higher and well south of me. A little later he was closer and made a few cool turns (still high though, maybe 2000 feet). Then I assumed he was gone, but at 6:15 I heard the rumbling again and ran to the back yard just in time to catch him flying directly overhead! I took a video this time. He was heading back to ORH (I could see him lowering the landing gear when I reviewed the video). While checking the schedule I took the opportunity to schedule a flight myself in the B-24, with which I have a family connection. That will be 8:30 Monday morning. I'm psyched! One thing I've always had a problem with in my own recording efforts is drums. I've used all sorts of pre-recorded drum loops in my songs and demos (including a set recorded by Mick Fleetwood), and I've tried to learn the various drum programming tools or plug-ins that are available for use with SONAR, but I never quite "got it." I admired (and envied) my producer Roger's ability to hear me play a new song on acoustic guitar and immediately start to lay out a drum track that works for it in Protools. It's talent and experience, I know. I want some! I still don't have that ability, but I made a breakthrough this weekend with an old (1991!) book and a new iPod Touch app. 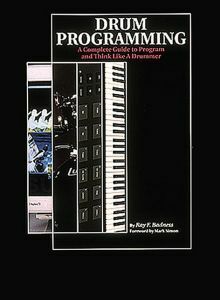 The book is Drum Programming (A Complete Guide to Program and Think Like a Drummer) by Ray E. Badness (love that name!). It's a thin book with basic discussion of the features and limitations of drum kits and drummers (including the unfortunate fact of only two arms and two feet). Plus a ton of examples in a very simple tabular notation. The app is Easy Beats 2, and it's just great. I had played with the free version and wasn't too impressed, but the ability to save and load patterns and drum kits in the full, updated version ($4.99) makes a huge difference. I was quickly able to enter the examples from the Badness book and hear the effects of different kick drum, high-hat, and ride cymbal patterns. It's easy to experiment with changes and new patterns, and you can easily sequence up to 16 patterns into a full song. There are a number of different drum kits, from basic synthesized kits to real recorded kits and more. Best of all, this simple deconstruction of drum track basics, combined with a DIY "workshop" on drum patterns, now has me listening with fresh ears to the drum parts on all sorts of songs, even songs I've heard a million times or even wrote myself (with drums programmed by Roger). I still haven't done a fully original drum track for a song of mine, but I think I'm getting close. I have ordered a new, powerful laptop PC and the latest version of Cakewalk's recording software (Sonar X1). This will replace my now-dead 2002-vintage desktop PC which would barely run SONAR 3. With this and the many new music tools on the iPod Touch, I'm ready to start a new musical chapter of some sort. Meanwhile I have a few new musical experiments on SoundCloud. I've been trying to learn a bunch of music apps on the iPod Touch, as I have written about recently. The best way to learn them is to create some music, so I have, and I've posted some of these musical experiments on SoundCloud (which is free for some amount of music hosting - pretty cool). Most of them are one to two minute improvised instrumental fragments, but this weekend I wrote and demoed a new song, "Open Up Your Eyes," and that's up there too. The lyrics are incomplete and the demo is pretty rough, but not bad considering that the iPod is providing all the instruments as well as the "studio" for this little project. I think it's cool, but now it's time to do something else with what's left of the weekend. The Science of Tyrannosaurus rex: Using digital paleontology to reconstruct one of history's largest carnivores. These animations and explanations are really amazing and the first one about how T. Rex walked is funny too. The music doesn't really apply now, but T and his friends did manage to stay alive for quite a few million years. 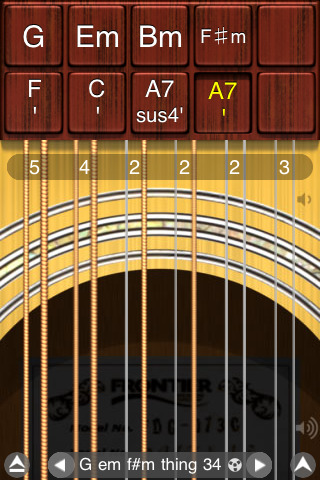 I've been playing around with a bunch of songwriting and recording apps on my iPod Touch. I feel like a new songwriting and recording phase is brewing, and until I get a new recording PC to replace my broken old desktop, all I really have to work with is my iPod. Fortunately iOS apps for music have really improved, and many of them now support audio copy/paste or WAV file import/export, so it is possible to chain together the results from several apps. Guitar/voice - Play around with chord progressions on a guitar (sometimes keyboard) while singing melody ideas (with lyrics or "la la" placeholders or some combination). Record fragments for later review, record a simple demo when more or less complete, usually guitar/voice on SONAR. BIAB - Play around with chord progressions, styles, keys, tempo in the PC program Band in a Box, tweaking and singing to that track. Import MIDI from BIAB to record demo in SONAR. I documented an example of a song written and recorded with BIAB in early 2009. Rhythm based - Like (1), except using a drum machine or drum loops in SONAR to drive the song away from habitual strumming or finger picking patterns. SONAR is a big plus in all of this - it easily integrates audio and MIDI recording with any number of tracks, including various looping and synthesized sound possibilities. 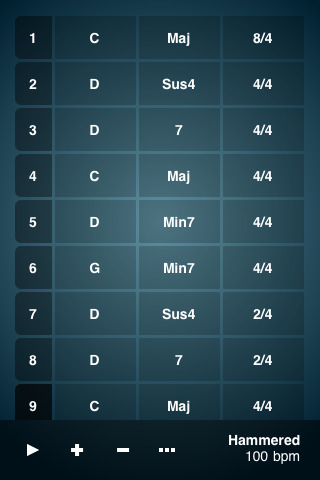 ChordBot - Similar to BIAB in that it is based on progressions defined by chord names with your choice of key, tempo, and playing style, but with many fewer styles. It has both WAV and MIDI file export. Multitrack DAW - I recently wrote about this app. I've upgraded to 24 tracks (total cost about $25). It's no SONAR (no MIDI or looping support and very limited audio effects), but it does the job for basic multitrack audio recording. 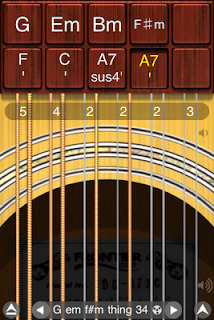 Guitar and iShred - These guitar simulation apps (acoustic and electric) use programmable chord buttons with strummable/pickable virtual strings (picture above). Good sounds, good UI, decent copy/paste. Expressive strumming or picking is pretty hard but possible with practice. I also have the PianoStudio app from the same company. 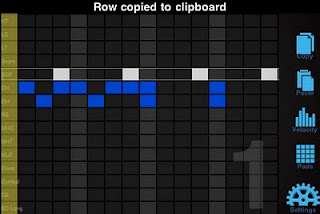 Same idea, but you can program complex patterns (or chords) onto buttons with the phrase editor (similar to the piano roll interface in many MIDI-based applications). I'm just figuring out how to use this app. Could be useful for adding piano parts to some recordings since it supports audio copy/paste. It replaces the burden of accurate performance on a tiny screen with the burden of breaking the piece down into parts and assigning them to buttons which you then press in sequence to perform the piece. ThumbJam - Brilliant UI and great sampled sounds as I have written about before. Recording & looping work well but with very limited editing capability.The wide range of scales could lead to some innovative melodies and song ideas once I stop fiddling with it. Pretty good copy/paste support. There are some odd tempo and looping issues that I'm still trying to overcome, but it really is the most "musical" app I've yet seen for iOS. It uses the touch screen and the accelerometer (tilt and shake) to support truly fluid instrumental performance (just add talent!). SSW - Simple Songwriter uses button-driven piano block chords that you can play and record. Limited time options (3/4 or 4/4 with controllable tempo), clunky sound on playback (overly time quantized? 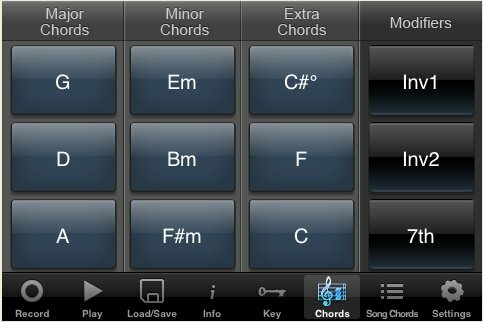 ), and no copy/paste or export, though it might have a song or two in it, at least for a chord progression idea I can write down and use in another app like Chordbot. Key word is "simple." Loopy - I just got this "beat box" app, and it has an impressively easy interface. Not sure yet if this is really a useful tool for my 70's style songwriting, but it sure is cool. 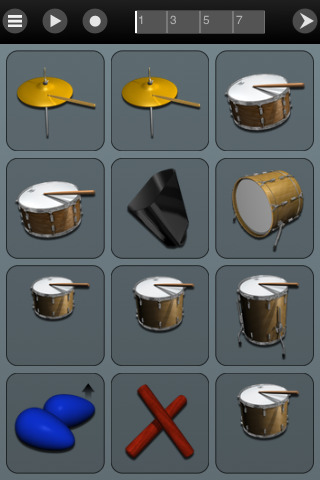 BeatStudio and DrumTracks - Two of many drum machine type apps that I'm still trying to figure out. Some copy/paste and other transfer options for moving rhythm tracks into Multitrack DAW or ThumbJam. I'm not a very good drummer, but I can come up with some decent sounding things for demo purposes. I'm still mostly experimenting with UI, copy/paste, and available sounds and rhythms using short examples. I have some promising fragments. I haven't really written a full song or recorded a full demo yet, but I'm getting close. Songwriting isn't all or even mostly about technology - I've written songs with nothing but my voice and paper on a plane (singing the result into my voice mail at the airport after landing - this was before I carried a voice recorder or equivalent device like a smart phone or iPod Touch). I've also written dozens of songs with just a guitar and my voice. But new technologies can inspire new ideas and approaches, and I think these iPod tools will yield some cool results before too long. I just love today's APOD, a low altitude photo of the Apollo 17 site taken recently by NASA's Lunar Reconnaissance Orbiter (LRO). With its orbit adjusted to make a low pass of about 22 km above the surface (about 14 miles or 73,000 feet), it was able to capture a very detailed view of the LM descent stage and other hardware left behind at the site, as well as the tire tracks from the Lunar Rover (LRV). 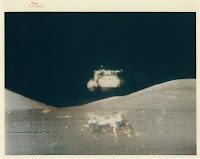 The picture below shows the A17 descent stage just after the ascent stage launched on December 14, 1972 (video frame from the TV camera on the LRV, parked about 150 meters away as shown in the LRO photo above). This should finally put to rest all the nonsense about how the moon landings were faked, but of course conspiracy theorists will take it in stride - after all LRO is a NASA spacecraft that is (allegedly) orbiting the moon, and how easy would it be to fake this picture with PhotoShop? Child's play! 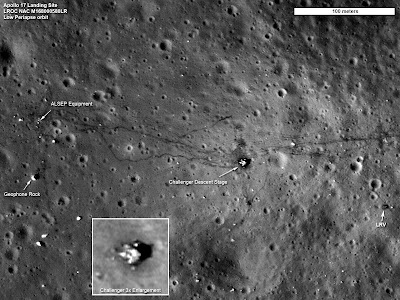 They've kept the secrets of the moon landings covered up for nearly 40 years, why stop now? September is the only month in which you can apply to become a JPL Solar System Ambassador. This is a great volunteer program for educational and community outreach on space exploration and astronomy themes. If you have an interest in space exploration, enjoy sharing your enthusiasm with others, and would like to learn more about space exploration yourself, this program might be just the thing for you! Although I haven't been as active recently as I was a few years ago, I've really enjoyed the outreach events I have done and the training I've received as a Solar System Ambassador. And you have to admit it's a cool title. You can find more information and a link to the application here. The program only operates in the United States. In case anyone is wondering about the lack of space-related blogging in recent months, I will briefly explain the concept of "serial obsession." Throughout my life I have had a few major non-career interest areas, and apart from the ever-present themes of books and music listening, I tend to pursue one or two of these interests obsessively for some period of time, ranging from weeks to years, then move on (or back) to something else. The major categories are music creation/performance, languages, flying, and space. The latter two are somewhat linked, at least historically (my interests in space and in flying emerged around the same time, around 1962 when I was 9 years old). From 2005 to 2008, space pretty much held sway, starting from my discovery of the free Orbiter space flight simulator in early 2005. That led to blogging about Orbiter, writing Go Play In Space, becoming a JPL Solar System Ambassador, educational outreach, and getting involved with an astronomy club (mainly for outreach related to space). Music was the theme for 2009-2010, culminating with the "release" of my second CD (Message from Tomorrow) in June 2010. The rest of 2010 and early 2011 were mostly eaten by my job (company was acquired in October 2010). This summer I have gotten back into flying, as reported in excruciating detail on my flying blog. So where is space? It is lying fallow at the moment, waiting for its turn to come again on the Great Circle of Obsessions. I'm sure it will come. The budgie's not dead, it's just resting. Just like the US space program (I hope!). But I do continue to at least peek at the space blogs and at the emails I get from NASA, and yesterday something really cool arrived. JPL announced Eyes on the Solar System, an interactive, 3D, real-data-driven, web-based "browser" for all the contents of the Solar System. It's different from Orbiter in that it is web based and (JPL) data-driven, rather than spacecraft oriented. There are indeed many spacecraft in "Eyes on the Solar System," and you can tag along with any of them, as shown in the picture above (Galileo fly-by of Io in 1995). But you can't launch your own spacecraft - or put another way, you don't HAVE to launch your own spacecraft to explore any place, object, or time in the solar system. It's VERY cool and I plan to explore it and write more about it as soon as I can. Maybe that will be the trigger for the next big space phase. Who knows? As this blog's tag line says, "Space flight, simulators, astronomy, books, flying, music, science, education: whatever the obsession of the moment might happen to be."